Home > Digestive Disease > How To Treat Diarrhea With Food Poisoning? With the increasing tendency of food contamination and ready-made packet food intake, global health is having some unavoidable challenges. Food poisoning is one of the foremost names from the diseases. It happens due to toxic or spoiled food. In respect of the foodborne illness the scene of the USA, in particular, is quite alarming. The statement from Centers for Disease Control proves that one in a six USA citizen is afflicted by ailments of diarrhea with food poisoning. Common symptoms of food poisoning include experiencing nausea, vomiting, abdominal pain, cramps, and diarrhea. This diarrhea may sometimes be bloody. 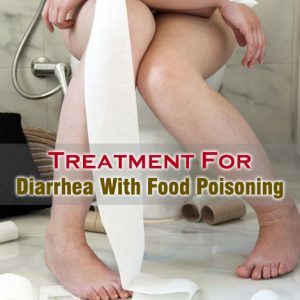 Have a look at the most common and primary remedies for diarrhea with food poisoning are given in the following lists. Another pivotal aspect is being aptly hydrated to fight the bacteria. Loss of fluids is common in diarrhea with food poisoning, taking adequate fluids will help in regaining of lost fluids. In this regard coconut water and Fruit juice can be sheer help as these help recovering fatigue with electrolytes and good portion of carbohydrates. Antibiotic medications are prescribed when the symptoms are severe. Imodium A-D and Pepto-Bismol are some of the most popular medications that are well accepted in the control of diarrhea and that subdue nausea. It is always best to take treatment as soon as possible. Normally the treatment takes three to five days to cure a patient but here what plays the crucial role is utter care and proper rest. Don’t eat or drink for few hours. This will help your stomach to settle. Take food, when you feel like eating and that too take food that can be easily digested such as rice, banana, toast, etc. One must avoid caffeine otherwise the digestive tube will be disturbed and some decaffeinated drinks can pacify the burn of stomachs during the illness. Notably, if the patient does not show any noticeable recovery from the weariness then admission in a hospital is the only way.